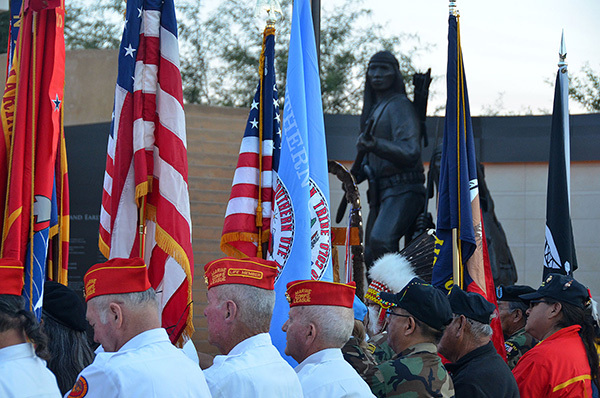 Join veterans groups, color guards, performers and speakers at the American Indian Veterans National Memorial on the grounds of the Heard Museum for a special sunset tribute to all those who have worn America’s uniform in the nation’s armed services. The one-hour ceremony begins at 5 p.m. and is free and open to the public. Museum director and CEO James Pepper Henry (Kaw/Muscogee Creek) will welcome visitors and guests and the observance, whose master of ceremonies will be Jeff Begay (Navajo). The color guard from American Legion Ira Hayes Post 84 from Sacaton, Ariz., will present the colors. Urban Giff (Akimel O’odham Pima) of the Ira Hayes post and Dr. Katherine Mitchell, who has treated patients at the VA Hospital in Phoenix, will make remarks at the ceremony. Performing the national anthem on the flute will be Aaron White (Navajo/Ute), who has been entertaining audiences for more than 20 years. White is a Grammy Award nominee and Native American Music Award winner who has many film and television credits to his name from ABC to PBS, as well as Sundance Film Festival entries and independent film productions. He plays with flutist Anthony Wakeman along with performing solo around the country. White is also an award-winning Native American flute maker. When not on the road, he gives lectures on the Native American flute and the history of the instrument. Performing special tribute songs will be the Thunder Springs Drum Group. In observance of Veterans Day, on Tuesday, Nov. 11, all U.S. military veterans and active-duty service members and their families will be admitted to the museum free of charge. Proceeds from the annual American Indian Veterans National Memorial Golf Classic, Friday, Dec. 5, at the We-Ko-Pa Golf Club at Fort McDowell, Ariz., will benefit the memorial and help produce Veterans Day and Memorial Day events there. Color guards led by one from the American Legion Ira Hayes Post 84, Sacaton, participate in the November 2012 dedication of the American Indian Veterans National Memorial.